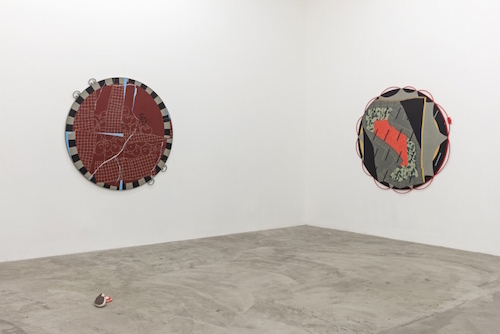 View of “Vanessa Maltese: Birds Flew Down to Peck at the Painted Grapes,” 2016. Vanessa Maltese has chosen the tondo, a circular panel common during the Renaissance, as the shape for her latest suite of four paintings. Circles are important. Recall the mandala, crafted to represent the universe. Nature makes things round: fruits, planets, and stars. Maltese too is making things round. In Aware of Surroundings (all works 2016), for instance, circles repeat abundantly: Small tondi pepper the panel and frame, squishy rings of lavender rattle in the background, and a cartoon hole recedes to what feels like infinite circular blackness. With only four paintings and a pair of shoes, the minimal configuration of the show allows for space to take in the abundance of details parading across Maltese’s panels. Capacity for Self Control is set in a striking steel frame composed of hot-red asymmetrically arching tubes. Floating in the foreground is a patterned scarf-like shape with a section of coral-pink pulsing out and then back as black rectangles hover above. In the background, concentric circles push the eye outward, snapping you again to the frame where the artist has playfully attached a red claw hair clip. The only ready-made in this skillfully crafted exhibition, the accessory pulls you from the painted world back to the realm of people. Meanwhile, the shoes—a pair of sneakers titled Self Portrait (Company)—are engaged in a game: At first they seem real, but upon inspection, one realizes they are cast. Noticeable brush marks reveal that the white shoelaces are painted, too. Indeed, all of the masterfully applied oil paint in this show achieves surfaces akin to tempera—it is a great development in the artist’s oeuvre.